Probably the oldest recorded feature on the Hill is the four and a half foot long carving of the Sun Goddess and its lesser-known counterpart the Moon God. The Sun Goddess is carved in a human crucificial form and its name refers to the sun ray design at the feet of the goddess. The figure’s central axis is orientated 100° magnetic; the feet point roughly towards the rising sun at midsummer. It appears to have been re-cut at some point in the past, but has retained much of its original detail. Much of what we know of these carvings is shrouded in mystery but they are believed to be Norse Irish in origin and it has been suggested that they are from the late 9th century. If this dating and origin are correct the deities would be named Sunna (sun) and Mani (moon). Sunna and Mani where children of a giant named Mundilfari, who was known as the turner of time. Sunna is a tall, golden and beautiful goddess and crosses the sky every morning with wild abandon in her sun chariot pulled by Allsvin and Arrakar (see focus point 10). Behind her chariot she pulls the sun and before her runs Daeg (Dag) her herald who rides Skinfaxi (a red bay horse) whose mane casts red light as it goes, creating the sun rise. Mani is calmer than his sister and was generally deemed more thoughtful; he is renowned for his compassion especially to children in trouble, Mani’s chariot was not pulled by horses but by two large dogs. Mani seldom uses his chariot as he is god of walkers and travellers and often just walks across the sky. He also has a herald, called Nott (a Jotun goddess, and mother of Daeg the sun herald) who rides a pitch-black steed named Hrimfaxi. As Hrimfaxi rides through the sky, water drips from his bridle covering the realms of the gods and men in a fine layer of dew which is found by those rising early in the morning. The carvings are extremely delicate. Please do not walk on them, clean them, outline them in chalk, or worst of all, attempt to restore them. I would just like to know if the group hidden myths and legends that are in the Wallasey news had permission to clean with water and brushes, and then chalk the moon goddess as they say they have on there website. I was quite worried that they could have done some damage as you have a warning about the carvings being delicate and asking people not to clean or chalk them. It would be a shame for them to be damaged as they are part of the hills history. To be fair, the warning was only added today, in the hope of preventing further damage. The carving of the moon goddess (or god) was not lost, but it was covered by undergrowth — for a very good reason. Undergrowth does less damage than people, however well-meaning. We had hoped that the carving could be dated from scans of the toolmarks left by the original makers. Cleaning them, chalking them, or re-inscribing them might make this impossible. I would like to see the carvings recut and preserved as they are wearing away to nothing. Every 7 years the white horse is recut to preserve it. We should be doing the same here. The worn away state of these carvings is very disappointing. The horse is barely visible, as are the mummers. The Goddess carvings are becoming less and less visible as time goes on. Can we not recut them and place railings around them to prevent them being upon? Our Ranger has advised that the carvings will be re-cut at some point, there are some that need to be properly identified first of all before they are lost. Railings are not an option for protection because of the friable (fracturing) nature of the rock around the carvings. 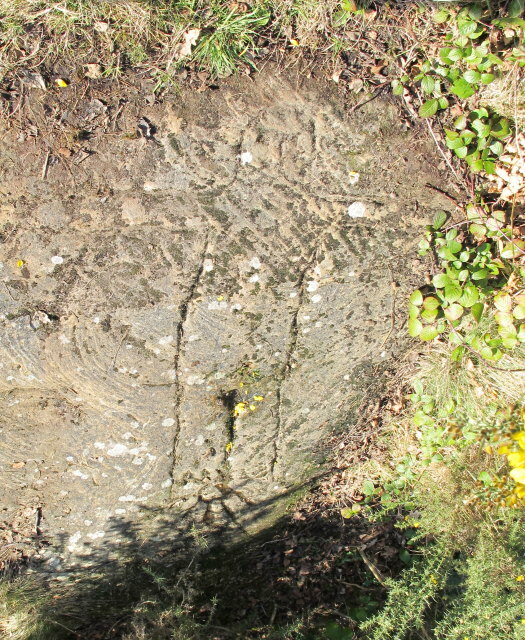 Please can you tell me if these carvings were known to exist in the nineteenth century, or were they rediscovered more recently? I’m currently in the middle of an art and design project based on the myths and legends of Bidston Hill and the Wirral. I have been facilitated by the myths and history attached to the Hill. We visited the site yesterday, but were unable to fine the Moon God. The Sun Godess and horse were barely visible, the wolf carvings were in a better state but they were not marked by a wooden post, which I thought was strange. There is also a large spiral design between the observatory and the Mill it is very deeply carved, do you know if this carving is new? I have pictures if you would like me to send them over? Plus I’m sorry to say a lot of your signs have been vandalised, which is such a shame as myself and my children found it wonderful walking round on our treasure hunt. Also do you have any further information on the strange line markings not far from the Sun Goddess? We were also unable to find the Green Man, he is not on the map. Do you happen to know where he is situated, I was told he is just passed the observatory? I would love a photo on my next visit.